West 49 is currently collecting coats for kids who don't have adequate winter clothing. 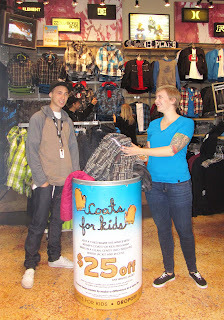 The West 49 Coats for Kids Campaign began Oct. 6 and runs through Nov. 17, 2011. Coat collection barrels are available at West 49 in Midtown Plaza. Donated jackets will be given to the Saskatoon Food Bank for distribution to needy children. To date, more than 75,000 children have recieved winter coats as a result of this national program. The national goal is 16,000 coats in 2011. ﻿﻿﻿As an added incentive, everyone who brings in a clean, gently used, insulated winter coat will receive $25 off any West 49 winter jacket. During the coming months, saskmom.com will be highlighting opportunities such as this for local families to help others within our community and to teach our children the important lessons of gratitude and giving. Share ideas and opportunities below or at info@saskmom.com. One in seven Canadian children lives below the poverty line.